Promoting, assisting and delivering general practice education at all levels of undergraduate, postgraduate, vocational and non-vocational training. Encouraging, carrying out, collaborating or assisting in research into all facets of general practice education and training. What purposes are the funds available for? encouraging, carrying out, collaborating or assisting in research into all facets of General Practice to improve General Practice education and training. What is defined as the region? Do all of the activities have to occur in the region? The region is defined as the Hunter, Central Coast, Great Lakes, Manning and New England regions of New South Wales. Activities must occur predominantly within these regions. Research that utilises or collects data from outside of the region may be acceptable, however the majority of the research must be conducted in region. How much funding is available and how much can I apply for? There are no set funding limits on grant applications. Applicants should carefully consider how much funding is required to successfully complete the project or research, including whether other funding sources are available. As a guide, the Trust will distribute up to $300,000 per annum in total across all grants. However, the Trust may distribute more or less depending upon the quality of the applications received. In 2017 two grants were awarded. What is the GST treatment of Grant funds? VTCCT is not registered for GST. The Grant funds and corresponding Sales Invoice will have no GST component. - If you are registered for GST, please do not include GST inclusive values in your submitted budget. - If you are not registered for GST, you may wish to include GST inclusive values in your submitted budget where your supply includes a GST component. If I am successful, will I be funded for the entire amount I have applied for? Any funding amount offered on behalf of the Valley to Coast Charitable Trust will be at the discretion of the Trustees and based on their assessment of the application. The amount offered may not be the full amount requested. All applications will be assessed according to the stated eligibility criteria and evaluation criteria. Decisions on the success or otherwise of applications are at the absolute discretion of the Trustees. How long will it take to find out if I have been successful? Applicants should know within 12 weeks of the closing date for applications whether their submission has been successful or not. What happens if I am successful with my application? You will receive correspondence from the Trust confirming your successful application. The correspondence will include the terms and conditions of the funding as well as any additional reporting requirements. What happens if I am unsuccessful? You will receive correspondence from the Trust indicating that your application has been unsuccessful. Am I able to apply for future funding rounds? Yes, you may apply for future funding rounds with either the same project or a different one. Can I submit more than one application per funding round? The Valley to Coast Charitable Trust was established in 2016 by the Directors of the former general practice Regional Training Provider (RTP) – General Practice Training – Valley to Coast Limited (GPTVTC). 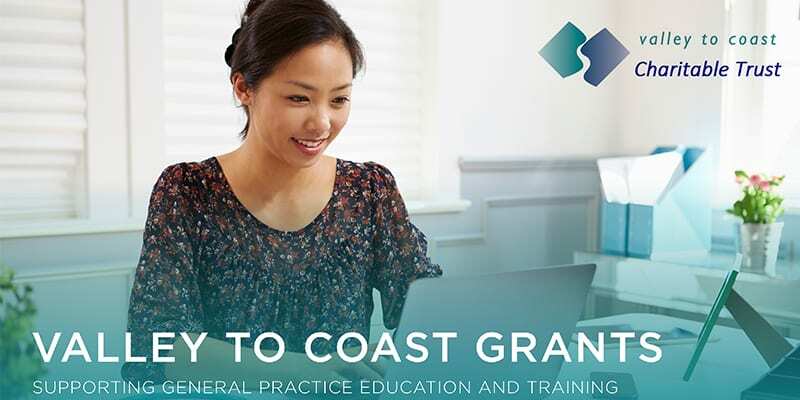 GPTVTC previously conducted the training of GP registrars across the Hunter, Central Coast and Manning regions of NSW. Changes to the RTP network occurred at the start of 2016, with all of NSW being overseen by a Sydney based GP training provider.